In this production, Laurie Blue’s son David fondly remembers his Dad as we pay tribute to this special man. David tells of his Dad’s devoted love to his family, draft horses and bluegrass music. 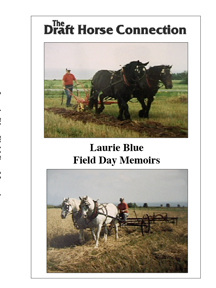 Laurie Blue was known on Prince Edward Island for Blue’s Field Day that was held at Little Sands, PEI as an annual event. Laurie had gathered a collection of 200 horse drawn implements and his passion was to have this equipment working at Blue’s Annual Field Day. Video footage courtesy of David gives a glimpse of Blue’s Field Day that was held in 1993. This footage shows a TV reporter interviewing Laurie at the field day in 1993 as he explains his passion of working draft horses as well as he and other teamsters are shown demonstrating his Â horse drawn equipment. This rare collection of horse machinery is now moved to Dundas Exhibition grounds where it is displayed and demonstrated each year. The memory of Laurie Blue’s Field Day lives on today. David’s band, Blue Streak – First Impression performs, â€œHe Showed Me The Ropesâ€. Â This song was written as an inspiration to their fathers. As well Laurie and his friend Annabelle Brehaut sing a beautiful song, from their CD, Treasured Memories Â â€œHe Set The Timeâ€. This production truly honours a great husband, father, friend, teamster and musician.